With 500 million tweets sent into the ether every day, it can be difficult to sort the wheat from the chaff on Twitter. This is one of the areas where power-user-tool-of-choice TweetDeck can lend a hand. It includes an engagement filter to let you focus in on high-profile tweets and cut out the less important ones. Here's how to set it up. The first step is actually getting yourself on TweetDeck, owned by Twitter since 2011. It brings real-time updates, advanced search capabilities, multiple account support and a bunch of other features that you're going to come to rely on. We've previously published a selection of tips on using the app. Here we'll show you just how to use the engagement filter specifically: It works on any search column in TweetDeck but won't show up on the others (like Home or Notifications). You can of course combine it with any of the app's other filtering options, like the ability to exclude certain keywords from your search results. 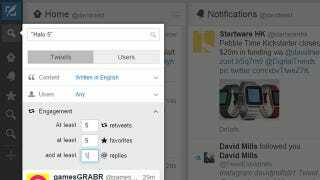 In the TweetDeck web interface, click the plus icon to the left to create a new column. We're interested in searches, so choose the Search option and enter your keywords. You might want to keep up with breaking news, or a favorite topic of yours, or job alerts, or whatever you like. Hit Enter and the search filter options appear. Engagement is the one we're interested in; you can set a minimum number of retweets, favorites and replies that a tweet needs to show up in your column. You'll have to use your own judgment here based on how popular the topic is and fast you want the column to be scrolling by. Click Add Column to confirm and you can position it wherever you like in your TweetDeck dashboard. A small status bar shows the filters you've applied and can be changed at any time using the sliders icon at the top of the column. You'll probably want to tweak the user engagement values over time once you've seen how the search plays out.